Subsistence farming using bullocks was largely replaced with large tracts of land ploughed by tractors and mechanized harvesters and using GMOs to enhance crop immunity. And the now the next phase in the evolution of agriculture is a large-scale single crop unit that would give unprecedented output because drones would be deployed for multiple functions. With rapidly growing population, environmental degradation, global warming and the reduction of arable land, food security will be an acute issue and feeding the teeming population would require innovation in agricultural methods and the extensive use of drone technology. By 2050, the global population will be around 10 billion, and to avoid food shortage, agricultural production will have to be doubled. Precision agriculture, using GPS, GNSS and drones, maximizes the farm yield and helps the farmer to determine which crop is most suited as per the soil quality and geological conditions. The use of technology also warns the farmers in advance to take precautionary measures in case of unforeseen vagaries of nature. While precision agriculture is no more a new concept, but it is further undergoing transformations and embedding new technologies for better optimization of agricultural problems. Drones have a big role to play in precision agriculture and the role of drones would only increase and deliver the best quality outcome. Drones fitted with high-resolution cameras and precise sensors can be flown over thousands of hectares of farms and gather data, which could be utilized to map pest damage, crop stress and per hectare yield. Drone imagery would assist the farmer to monitor what’s going on in his farm, without the need of surveying the farm all by himself or hiring people for it. The farmer would get the precise idea that on which areas he should focus more, where to allocate more resources, and whether or not the area is suited for a particular crop or not, and what would be the probability of a high yield. This would certainly empower the farmers and mitigate uncertainty and vulnerability that always hovers over the agricultural sector. It is not that only the big farmers would benefit from drone technology. As governments put more emphasis on incentivizing the adoption of this technology and drones would be widely used in agriculture, in the future, they would be widely used as essential machines for cultivation. Apart from capturing aerial imagery, drones would also be used for sprinkling water and pesticides on the crops. This would save both time and wastage. Spraying using drones would be highly targeted and the drone would figure out and spray as per requirements. Similarly, drones can be deployed to spray herbicides on the farms. This would be a highly efficient method as currently herbicides are sprayed over the entire length and breadth of the form, but using drones herbicides would be sprayed directly on the unwanted weeds in the farm. Other special types of drones can also determine the exact quantity of fertilizers that would be needed in the fields. This would not only save fertilizers but also maintain ecological balance, as less of ozone-depleting gasses would be emitted with a targeted usage of fertilizers. Using a machine known as Greenseeker, sensors measure crop nitrogen deficiencies in real time and then predict yield potential for the crop using the agronomic vegetative index NDVI. 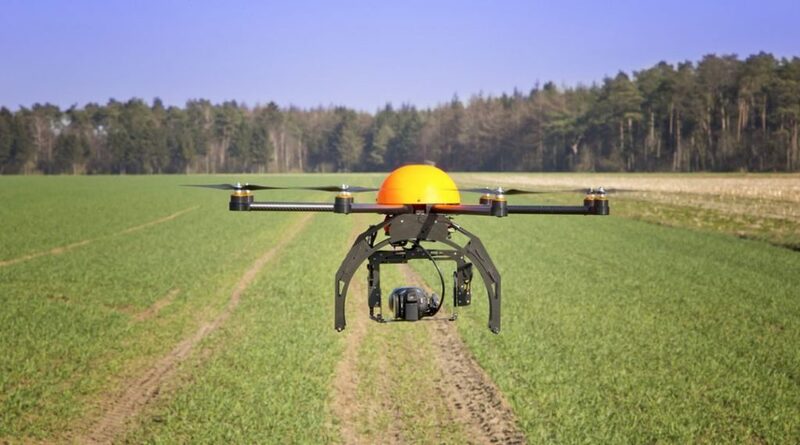 Drones would benefit farmers and everyone engaged in the agricultural sector in numerous ways. Farmers would be able to save time, money, and increase their knowledge about the growth patterns of different crops. Simultaneously, increased productivity and environmental protection would be in tandem.